Pea Pulao is one of my most favorite and also one of the simplest one pot meal. Though I have posted peas pulao recipe earlier, I wanted to do a step by step recipe with pictures for beginners. This pulao can be done in a jiffy and also tastes delicious. You can have any tomato based gravy or just onion pachadi as side dish for peas pulao. 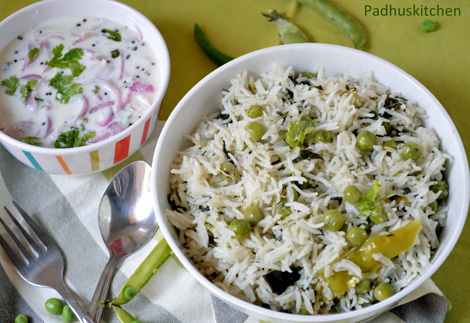 Today let us learn how to make peas pulao following our easy recipe with step by step pictures. Soak basmati rice for 20 minutes. Drain the water completely and keep it aside. You can do this with ordinary rice also but using basmati rice gives added flavor. Chop onions finely and slit green chilli. Heat oil in a pan/kadai and add the ingredients mentioned under seasoning. Saute for a few seconds, then add chopped onions, slit green chilli and saute until onions turn light brown. Add peas, chopped coriander leaves and mint leaves. Add rice and saute until the water (if any) evaporates. Add 1 3/4 cup of hot water, salt needed (approximately 2 tsp salt) and bring it to boil. Transfer it to another container and pressure cook for 3 whistles. Once the pressure subsides, open the cooker, fluff the rice with a fork gently and serve hot. If you are preparing directly in the pan, after adding water to the rice, wait for it to boil, then close the pan without weight. Keep it in medium flame. Once the rice is half cooked, stir the contents and close it with the weight. Keep it in very low flame for 5 minutes and switch off the flame. Open only after the pressure subsides. Watch the video of making pea pulao in pressure cooker directly . Serve hot with onion pachadi or any side dish of your choice. Paneer butter masala and potato gravy also goes very well as a side dish for peas pulao. my all time favorite Pulao Pads!! Super keeper recipe.. i ve a question.... my pulao always becomes mushy when i cook it in the pressure cooker... can you tell me why? Delicios,i reduced peas to1/8 cup & added 1/8 cup peeled and 1 " cubes potato,added 1/2 tspn Biryani masala. can we add the masala to cooked rice instead of cooking the rice along with it??? Since we do not have much gravy or masala for this dish, it is better to cook rice along with peas, mint etc so that the rice will absorb the flavors. You can cook rice separately and mix it but the rice will not have much flavor. An Indian lady I used to work with used to make this and I loved it. Will give it a try. Dear Padhu, i am very fond of cooking n keep on trying various recipes, gave a try to this recipe as well n trust me, my hubby liked it so much. Thanks a lot for such a nice recipe. Paddus Kitchen is not just a kitchen. It is a World of Recipes. Every item is a wonder. And you are showing an easy way to prepare these items. Thank you. I tried this peas pulao today..It came out to be very tasty full of flavour. All ur proportions were exact. .n I tried ur moongdal payasam yesterday ...came out yummy. .Thank u so much..keep rocking Padhu. . I tried this recipe today. .n wow..It turned out to be delicious. .so simple yet yummy..I tried ur moongdal payasam yesterday for my daughter s bday..It came out to be so tasty..n it made me really happy as I am not a pay as am person....u r a star. .Keep posting..God bless.. Followed you reciepe to yesterday.... it turned out great... thanks a lot. Nice recipe, tried it today,turned good and quick. a good toddlers tiffin recipe. Tried this today... Came out very well. Really flavorful. Loving it! Can we use Clove, Cinnamon and Cardamom in powder forms? You can use but that will be very strong. This pulao is very mildly spiced. Of yes, you can use seeraga sambar rice. If seeraga sambha rice is used, what should be the quantity of water to be added if the rice quantity is say 1 Cup.? Add the same amount of water 1 cup -1 3/4. If you find it mushy, reduce it the next time to 1 1/2. You have learn by trial and error as it depends on the quality of rice. Thanks for posting the recipe. I am trying to prepare a veg pulao recipe where the grains of rice don't end up sticking together. when you say one cup rice what's the quantity in grams? I cup is 200 grams of rice. Tips to prevent rice from sticking together when making pulao -saute the rice in a tsp of ghee (after soaking and draining the water completely) to prevent the rice from sticking to each other. Padhu (my culinary life saver), please tell me if I can do this in rice cooker?